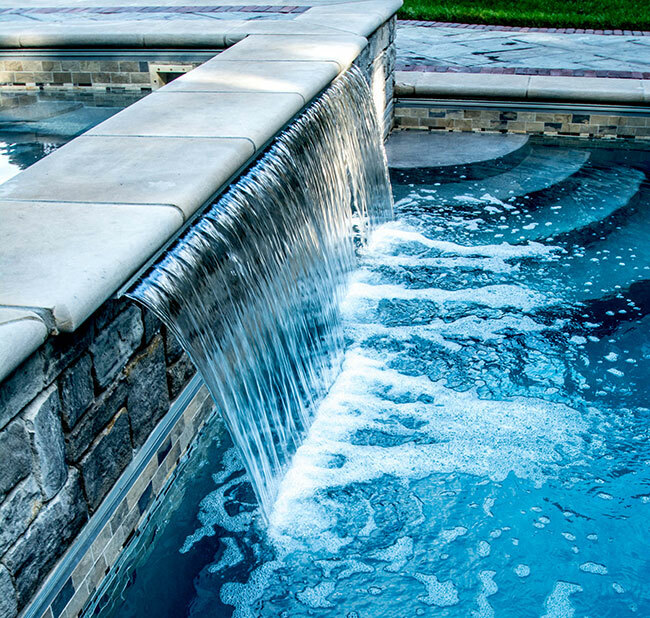 The clients wanted to add a pool, spa, waterfall and a pool house to allow for pool parties without access to their home. 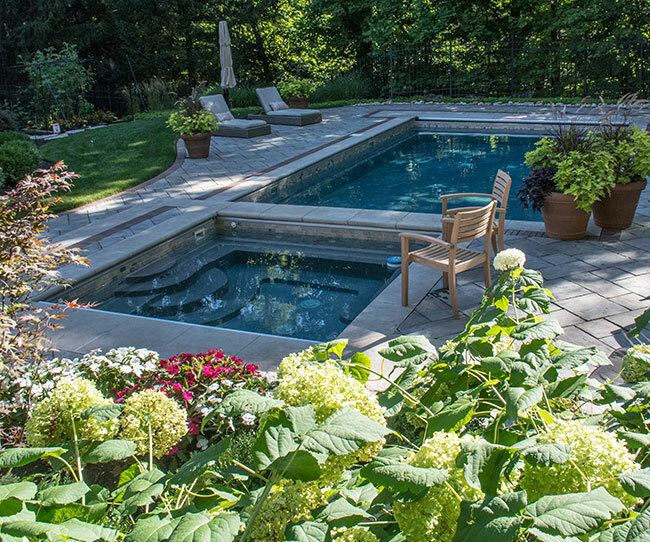 They also wanted to maintain as much lawn as possible and keep pool equipment out of sight and earshot. 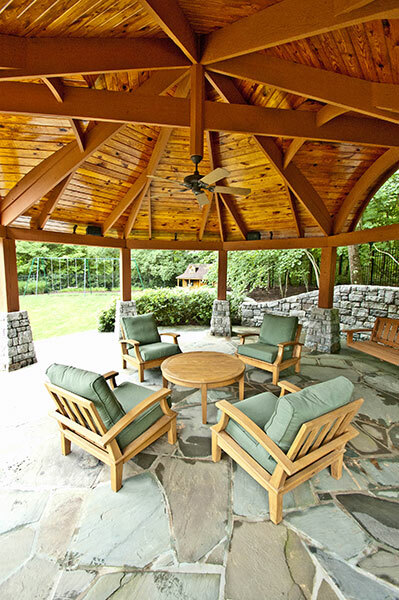 In the past, the company had built retaining walls, a patio, walkways, a covered gazebo, lawn areas, trees and mixed borders on the property. Property access was a challenge, with only 8 ft. of clearance in and out of which to bring materials. Not only was this area small, it was often wet because it was a grass alley between the home and a retaining wall. When subcontractors were involved, the Grunder team had preconstruction meetings and was on-site to oversee activity. At times, there were up to 30 people working in the same area. In the end, all goals were met and the new features blended seamlessly with the existing features. 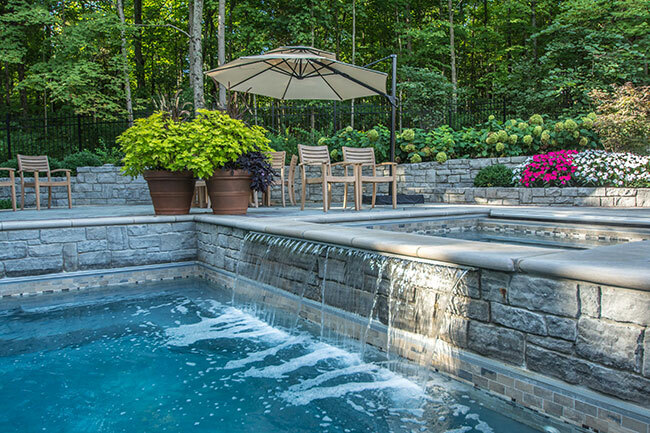 The project earned Grunder Landscaping a 2016 Grand Award from the National Association of Landscape Professionals’ Awards of Excellence program. 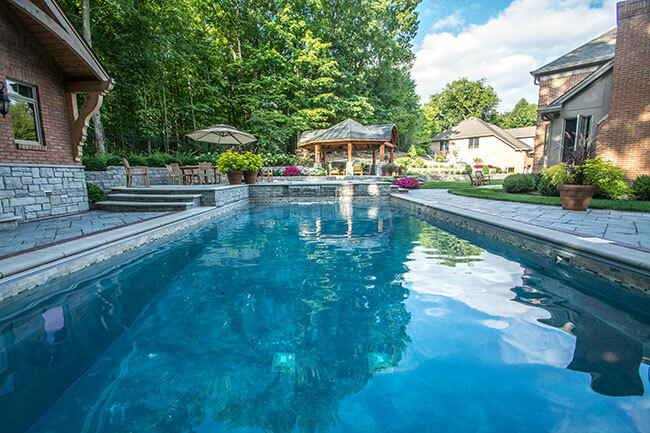 To ensure there was room for plumbing lines and equipment, Grunder handled the design and installation of the pool house utility systems and the installation of the foundation. This shows the opposite view from Photo 1. 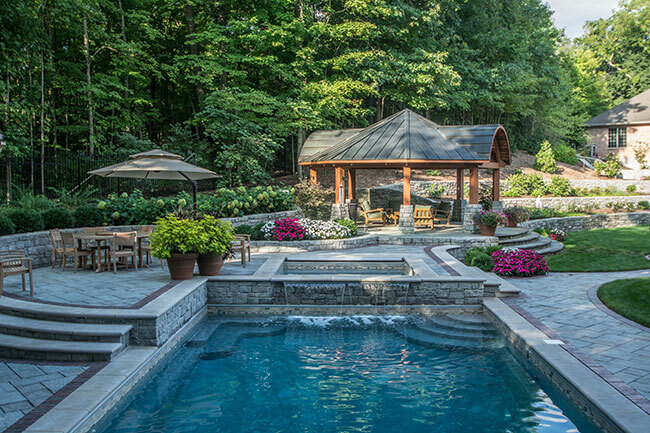 In this “before” photo, the small playhouse is near the final location of the pool house. 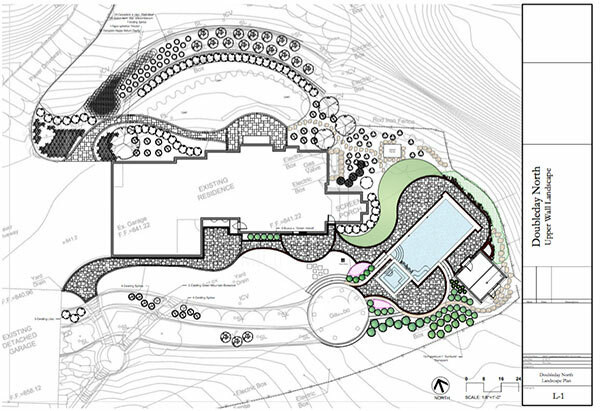 Where possible, Grunder designed around existing retaining walls; here, modified retaining walls to the right of the pool house are visible. 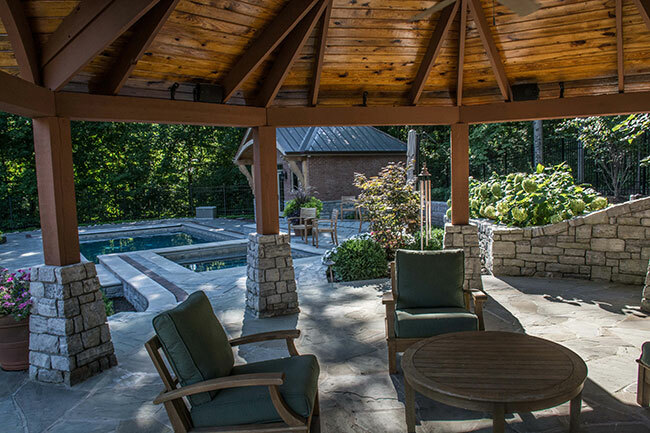 In this “before” photo, note the grassy area where the pool and spa are placed beyond the gazebo. Similar view as Photo 5, showing the new additions. 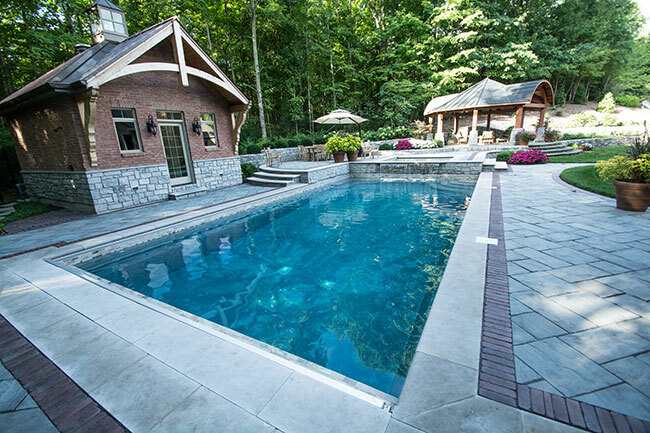 The pool house stores 40-plus plumbing/conduit lines to operate the pool, spa and bathrooms. 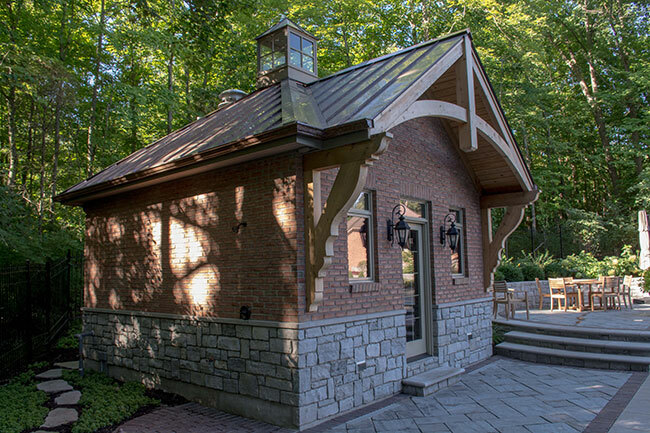 The pool house had to be designed down to the exact inch to ensure all items requested by the client would fit into a 17×17-ft. building. 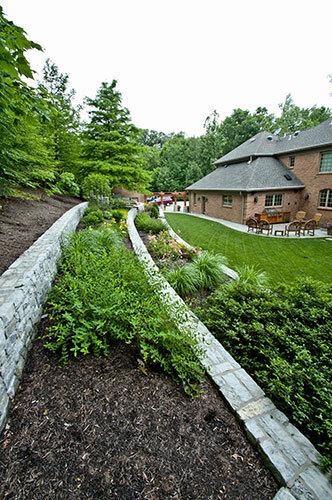 This “before” photo shows the existing retaining walls and the small area between the house and walls where the project was situated. The project began in October 2013 and was finished by May 2014. The frigid March weather was a challenge. Small stones were blocking the weir of the waterfall on the day photos were shot. Today, the waterfall is a solid water wall. Again, this closeup of the waterfall shows the pebbles that have since been removed. Note the upper patio and stairs. Marty Grunder’s 2018 Grow! Conference will be held in Tampa, Fla.